You don’t need a subscription to read today’s post! If you’ve ever been curious about the kind of information, tutorials and advice that you’ll get as part of your subscription to Webcomics.com, this is a good example. 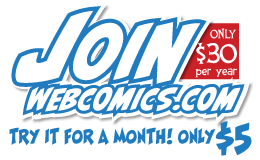 If you’d like to join the site, you can get a monthly subscription for $5 — or save 50% and get 12-months for $30! We’ve had an excellent discussion in the Private Forum about traffic-building on the post-ad-blocker web. In the course of the conversation, I started brainstorming on a special publishing strategy for longform comics that can’t/don’t use humor as a hook for their updates. I think it’s worth experimentation. And it’s all about cultivating the orbital reader. First, if you haven’t read the Private Forum thread, it’s worth it. So here’s the problem in a nutshell. 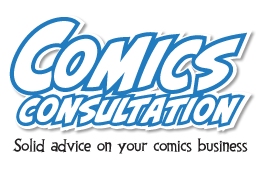 In order to grow a readership, a traditional webcomic has to follow a frequent/consistent/significant publishing format. Updates should be as frequent as possible, while maintaining consistency (of schedule and of quality), and each update has to be a significant reading experience — even to the reader who is just landing on the site for the first time today. If you want a more detailed discussion of this concept, please read this post from the archive. For humor comics — both longform and shortform — that’s a pretty simple prescription. The comic has to be funny every time — without relying on previous updates for backstory/context. Easy to say. Hard to do. But also, pretty crucial. For a comic that isn’t written to be humorous (or uses comedy as a spice instead of the main course), this is daunting. And, if this is you, it may feel as if the entirety of Wweb publishing is stacked against you. It may feel as if social media doesn’t work. Readers aren’t engaged. There’s a low ratio of signal-to-noise. But it’s all about the comic. If the comic is good, all of that other stuff can be addressed. That’s really frustrating for folks to hear. For a humor comic, it’s brutal. There’s no shortcut for writing better humor. Your only hope is to be an honest critic of your own work, seek outside opinions that you trust, and keep honing your craft. But for a non-humor comic, what if you’re already confident that you’re doing good work — and it’s still not happening for you? If the problem isn’t the comic, it’s the way you’re presenting it. You’re presenting your longform comic as if it were a shortform humor comic. In 2005. Is your latest page the first thing people see when they get to your site? Are you expecting people to path backwards through the archive? Are there no top-screen solicitations for downloadable chapters/books? Then, in my opinion, you’re using the wrong publishing strategy. Why? Because that was a system that revolved around pageviews. When ad revenue was an important part of your business plan, you needed ad revenue. But ad blockers have put a kink in that hose. Instead of bemoaning the cruelty of fate that has brought you so low, look at this for what it is. It’s actually… FREEDOM. You’re not chasing pageviews anymore, pal. That’s a total game-changer! Furthermore, crowdfunding giants like Kickstarter and Patreon are proving to be a much more potent replacement for that money. But you have to position those correctly. It’s not just plug-and-play. And that means you can completely rethink how you’re presenting your comic. You’re no longer publishing by the page. You are now publishing by the package — whether that means issue, chapter, book or volume is up to you. But you’re not publishing pieces any longer. You’re now publishing packages. Your home page should no longer showcase the latest page. Instead, it should showcase downloadable packages — PDFs of chapters (or even entire books). Your goal is no longer to generate pageviews. Your website should have one goal, and that is encouraging the downloading of you content. Of secondary importance on your site should be two things — reader outreach (including social media) and crowdfunding (such as Patreon). You need outgoing social-media links (links that people can use to talk about your stuff on their social-media feeds). Links to your social-media feeds are nice, but not as important. However, reader outreach such as solicitations to join e-mail lists, directions towards RSS feeds, etc. are very, very important. You’re no longer striving to attain the daily visitor — or even the regular visitor. Instead, you’re striving towards an orbital reader. You need to establish ways to pull them back into your gravitational field when you have new stuff to update. They’re not going to be headed to your site every day, so you need to develop ways to let them leave and then call them back. Finally, you need a prominent presentation of your crowdfunding options. This will most likely be a Patreon campaign, but it can be expanded to include Kickstarters whenever necessary. On your site, each of your downloadable packages should have a price — even if it’s only 99¢. It has to have value. It has to be a potential revenue-generator, of course, but more importantly, if it doesn’t have value, it’s not going to drive Patreon subscriptions. And that’s where I think you’re going to be able to replace ad revenue. Once you have 99¢ downloadables, you can offer them — in different combinations and at different rates — to your Patreon backers. Remember: Your goal should be to have monthly rewards for monthly pledges. Keep this in mind as you’re building that reward-tier structure. Everything I talked about in this post still applies to you. Now, you go into your publishing cycle. You’re not posting pages on your site anymore, but that doesn’t mean that you’ve gone silent. You’re posting previews, sketches and perhaps even pages for you Patreon backers. You’re on social media talking about your comic and posting sketches there (as long as you’re posting more for Patreon backers). You’re promoting the hell out of the downloadable packages in your archive, showcasing finished pages — or even multi-page sequences — from those. And it’s going to feel a little repetitive — especially if you don’t have a large archive — but, in social media, you’re the only person who’s really gonna notice. Your audience isn’t getting every single missive you shoot out into the ether, so it’s not nearly being received as repetitive as you think it is. And when you’re getting ready to post the next chapter/issue/book/volume, you’re going to start banging the drum, building up excitement and suspence. And when you do release it, your outreach (social media and otherwise) is going to be all about that new package! Your e-mail mailing list is going to get a big burst trumpeting its arrival! It’s going to be a major announcement on your web site. And after that dies down, you go back to talking about the archives (along with this new package) as you’re working on the next. Free content is at the heart of web publishing. And this publishing structure is no different. But here’s where you have to decide what works best for you. Do you publish the new package and then make the previous package a for-pay download? Do you make the new content for-pay, but release previous packages for free on an intermittent basis to drive reader interest? Do you release the new stuff exclusively on Patreon, and then funnel archive stuff to the site on a for-pay basis? Do you publish previews for free and sell the completed packages? There are dozens of variations — including coupons, discounts, promotional giveaways — that you can introduce to keep interest. Furthermore, as you build up your archive, you’re going to be able to repackage the packages. When you have enough chapters for a book, release the book. When you have enough books for an omnibus collection, release that, And so forth. As long as you price them wisely, you shouldn’t have to worry about cannibalizing your own sales. In fact, you should be able to drive sales to the new repackaged collections. 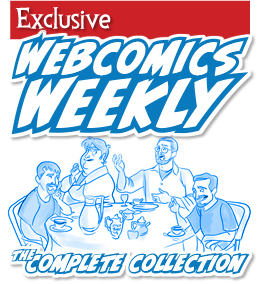 This is all about ridding yourself of about 17 years of what you thought a webcartoonist was. It’s above leaving behind everything you’ve been doing up until now. It’s going to be a shock to your readers. Heck, it’s going to be a shock to you. But if your publishing method isn’t working — and if you’re confident that it’s not the quality of the comic — then I’m not sure you have a choice.